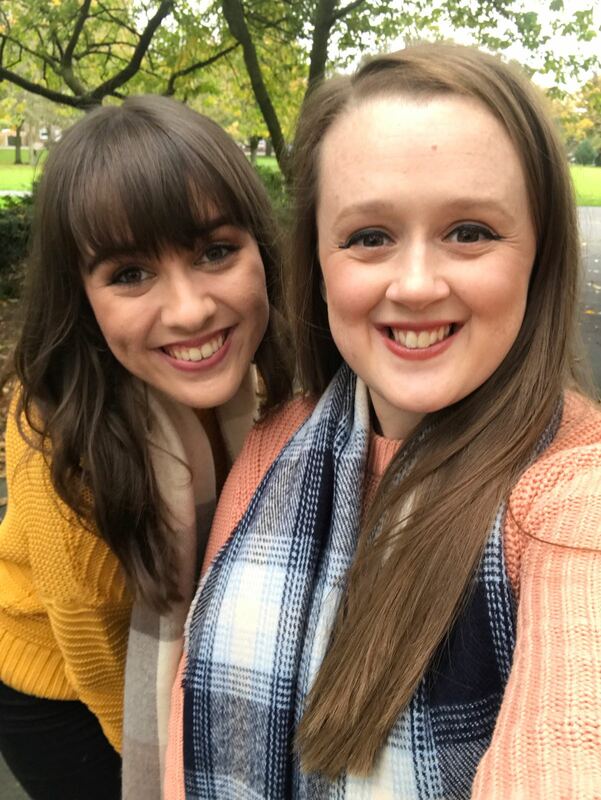 If you watch a bit of YouTube (which let's face it, who doesn't) then it's more than likely that you've come across one of the Vogue 73 Questions videos. It's basically a really quick interview with some of the biggest celebrities in the world - the last one I watched was with Zac Efron. It consists of someone following the celebrity around their home or office, not in a stalking way, and asking them questions about their likes, dislikes, achievements and life in general. It's the perfect way to get to know a little bit more about them. 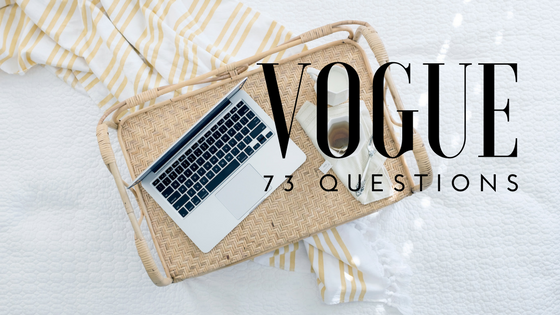 Now, I'm no Kendall Jenner or Gigi Haid but the lovely Emily over at Patterned Petals has tagged me to answer Vogue's 73 Questions. I'd grab a cup of tea and some snacks for this one because we might be here a while! What's the best thing that has happened to you this month? I'd say the best thing to happen was probably going to Peaky Blinders, a beautifully themed Hotel & Bar in Southport, and having potentially the nicest G&T I've ever had. What's the best thing that has happened to you this year? This is the obvious answer but all the magical trips I've done to Disneyland Paris this year and the beautiful people I've met because of it. April 12th really sticks in my mind, it's a day I'll remember for the rest of my life. What's the best thing to ever happen to you? I'm really struggling to answer this but I'd say it'd be a combination of getting into University, starting my job and getting my dog. Summer. What's better than summer nights on the beach, pretty dresses, festivals, sunsets and flower crowns. Christmas! It's almost time for the John Lewis Advert, Christmas drinks, the Coca-Cola advert, I'm a Celeb and Christmas light switch-ons and I couldn't be more excited. I lived in Liverpool for a year when I moved to University and I absolutely loved it. I like having things to see/do and I find that cities have the most to offer, as well as the best nightlife. Don't get me wrong, I love to escape to the small towns of Cornwall but I'll always be a city girl at heart. Never - it saves time when I have to put them back on again. My Grandma's homemade strawberry trifle, nothing beats it. I hate sushi. We had to try it for Japan day in year 9 and I threw up after it. Probably mayonnaise or ketchup, however, I've been getting into BBQ sauce recently. It's brunch, what do you eat? Either a hot roll with BBQ chicken or an English breakfast. Aqua Blue. It's like turquoise but just a little bit lighter. I'm very specific. I adored my prom dress - it was blue, pleated and had diamonds around the bust. It was absolutely perfect and my pride and joy for three months. I'll dig out a photo, hold on. I mostly blow dry my hair as it's quicker and saves me a lot of time in the morning. However, I've been letting it air dry a lot recently and I'm learning to embrace the natural curl in my hair. Physically, definitely not. Emotionally, to an extent. Who's a person you'd love to have coffee with? I have a few - Audrey Hepburn so that we can talk all things fashion. Zooey Deschanel because she's an absolute babe. Walt Disney because I'd love to see his imagination in action and Phillip Schofield because he's a national treasure. Also, Peter Kay because he's hilarious. Who's the last person you texted? My friend Mitchell asking him about his recent trip to Disneyland Paris for Halloween. I'm loving Instagram at the moment, I'm all about finding the perfect Insta. I think you should all go and follow my beautiful friend Emma. 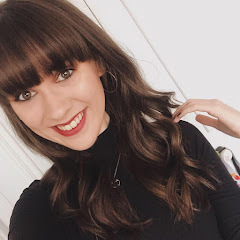 She's a blogger from North West England and one of the loveliest girls I've ever met. Her blog is brilliant and her Insta theme is to die for so you should all go and show her a lot of love. I've never had anything drastic stolen from me, just pens, bobby pins and bobbles at school. I loved Venice, Croatia and Lanzarote. However, I know that Cornwall is always going to be one of my favourite places in the world, the beaches and the scenery are to die for. I recently did a post covering this, but my top countries would be America (Florida/Cali/New York) and Australia. My first pet was a budgie called Tommy but I remember being absolutely terrified of him - I really don't like birds. It has to be Marie from the Aristocats because she's the sassiest little lady and the perfect role model for females everywhere. I also really love Eeyore - I just want to give him a big cuddle. As I'm writing this - I'll be going to work, coming home, minding the dog and trying to get a screenplay written. I'm excited about Christmas (obviously) and I've got some really fun plans for next week. If we're talking about the future, I'm looking forward to my 21st celebrations and my graduation - it's going to be such an emotional day. I've let my reading slack recently but I've been dipping in and out of 'Everything Everything' by Nicola Yoon. I read 'The Fault In Our Stars' because it was such a craze at the time and I absolutely loved it. Uni. I just want to be at my graduation ceremony and throwing my cap into the air. Gin & Tonic (duh!). Preferably Hendricks. There's nothing I love more than 2 for £12 pitchers in 'spoons and you can guarantee that mine will always be a woo-woo. What would you order at a McDonald's drive-thru? Chicken nugget meal with a banana milkshake. I'm not normally a fan of milkshakes, however, McDonald's do the BEST banana milkshake in the world. I'm a hoarder when it comes to sentimental things, and I don't know if I'm ashamed to say that I've kept most items from my childhood. But the one thing that sticks in mind is a teddy called Ellie that my cousin bought for me - she's a little toy dog and she comes everywhere with me. What's your current favourite TV Show? I have quite a few at the moment. I'm addicted to Riverdale, it has me on the edge of my seat every week. I've also started watching season 2 of Stranger Things and obviously I love watching New Girl - I relate to Jess Day on a personal level. What's a movie that made you cry? The movie that springs to mind is Moana. I sat in the cinema and sobbed like a baby. If you've seen Moana, you'll know which part I'm talking about. In terms of people, I miss my Uncle John the most. I still struggle to believe that he's not here anymore. I also miss College - I realise now that they were some of the best years of my life and if I could, I'd go back in a heartbeat. I've picked up a few nicknames over the years. My nickname in Primary School was Twiggy because I was so thin. I've also had Meggles, Smeg, Smeggles, Meggy and Megster. But most people just stick to Meg. Being with my friends, especially my work colleague, Sarah. I swear we have at least three cry laughing moments every single day. My Grandparents and my Parents are also absolutely hilarious. Peter Kay, Miranda and Micheal McIntyre have me howling laughing - I'm watching an interview with Peter Kay as I write. Wearing heels makes me feel really elegant but they always kill my feet after an hour, I'm definitely a flats kind of girl. I'm that boring, I can't think of an answer. I went ab-sailing once and that was pretty cool. I need more adventure in my life! What's one thing you want to do but are scared of? I've always wanted to do Tower of Terror in Disneyland Paris, and go on the Big One in Blackpool. I'll get around to it one day, I promise. What's the thing you're most proud of? I'm proud of a lot of things I've achieved in life. I'm proud of getting into Uni, having the courage to travel on my own and being able to work for Walt Disney Company. Believe it or not, I wanted to be a Nurse. I don't think I'd be very good at it though, considering I'm scared of Hospitals and I'm a massive hypochondriac. What's the most important thing someone can learn? Love and acceptance of who they are. We live in a world where we constantly compare ourselves to other people and we get so engrossed in their lives that we forget about our own. The sooner you learn to love yourself, and learn that you are worth just as much as the person stood next to you, the happier you'll be. I do like a bath from time to time, but it has to be showers for me. Beach House. I just love the sea. My favourite one is the Frankincense and Myrrh candle from M&S - it smells like Christmas in a candle. I'd either go and travel around America or Australia - maybe take in a few Disney parks along the way. My room is an absolute tip, however, when it comes to working, I'm very neat. What's the first thing you do each morning? I check my phone. It's such a bad habit but I can't be the only one. I never normally have time for breakfast, but when I do I have cereal or breakfast biscuits. Write in my diary. It sounds really sad, but I like keeping diaries - they're really fun to look back on. What's one skill you wish you had? If we're talking realistically, I wish I could drive. If not, then I wish I could fly and have the ability to see when people are lying to me. It changes every time. At the moment it's Texas BBQ, however, I'm a fan of Hawaiian and Fiorentina. My Dad - a girl got stabbed outside my Uni the other night so I rang him whilst I was walking down to the train station because I got scared. At what age were you your happiest? 18. I felt like I had more responsibility and it was a great year of my life. I moved to University, worked at the Disney Store, had an 18th and my social life was the best it has ever been. A biscuit shaped like a reindeer. I know you all wish your lives were as wild as mine. I don't really like being alone, but when I do need some time away I normally go to my bedroom. Or if I need to get out of the house, I'll take the dog for a walk to clear my head. What's the biggest thing on your mind right now? Uni Deadlines. I'm beyond stressed. Yet here I am, writing this blog post when I should be writing a screenplay treatment. I really want to keep up with my blog schedule but it's so hard with the amount of work I'm getting - I'm the most tired I've ever been. What's the best activity to do at home on a rainy day? Have yourself a pamper, paint your nails, write some blog posts and watch some movies. It sounds like a perfect day to me. I'm currently listening to 'Ordinary People' by John Legend. It's one of my favourite songs. I've always said if someone could play this on piano for me, I'd marry them straight away. 7 - I've got a lot of things to look forward too but I'm not quite there yet. I'm quite a fussy eater so when it comes to trying new things, I don't really like it. I think the weirdest thing I've ever tried is probably seaweed - I can't even remember what it tasted like. Dessert. There's always room for dessert. On my own, Paris. With my parents, Greece. Thanks again to Emily for nominating me to do this tag. I've really enjoyed it and I hope you've all got to know a little bit more about me. I tag anyone who would like to do this tag - if you do take part then be sure to tag me as I'd love to hear your answers to these questions!